In arguing food inflation is not the Federal Reserve’s (Fed’s) fault, Fed Chairman Bernanke points the finger at everyone but him. Just as with a lot of Bernanke’s policies, his argument may hold in an academic setting, but the real world is a bit more complicated. Yet, when quizzed about whether his policies contribute to commodity and food inflation, Bernanke argues that the Fed’s policies have only influenced equity prices to the upside, not commodity prices. While that logic is unlikely to convince a preschooler, the Fed chief goes on the defensive to defuse the argument that his policies may actually be destabilizing the Middle East and Asia, where a high portion of disposable income is spent on food. With regimes toppling left and right, Bernanke must feel he is carrying the weight of the world on his shoulders. Bernanke argues countries concerned about inflationary pressures stemming from food and commodities have plenty of tools to address these. Amongst those tools available to them are the ability to raise interest rates or allow their currencies to appreciate. Indeed, we have long argued that Asian countries in particular may allow their currencies to appreciate for exactly that reason. However, Bernanke leaves out a small, but important detail: with QE2, the Fed has dramatically increased the stakes, placing the proverbial gun to China’s head, effectively telling China’s policy makers to allow the Chinese renminbi to appreciate, or else. Having said that, Bernanke rightfully argues that the Fed’s mandate is to foster price stability and maximum employment, not to look after whatever the ills in the rest of the world may be. Trouble is, the very reason the Fed may be engaging in its super-expansionary policies is because it is trying to cure ills that are not part of its traditional mandate. Many of the Fed’s policies since the onset of the financial crisis have not been traditional monetary policies: a central bank usually applies a very broad brush in managing economic growth by controlling levers such as interest rates or money supply. However, when the Fed, for example, bought mortgage-backed securities (MBS), it steered money to a specific sector of the economy. That’s fiscal, not monetary policy, traditionally reserved for elected policy makers in Congress. Just like the MBS program, many of the Fed’s policies continue to appear to be attempts at addressing the “shortcomings” of Congress. A shortcoming is naturally in the eye of the beholder – we may like or dislike our politicians, but at least they are periodically up for election. Bernanke has felt, indeed testified, that one of the strengths of the Fed is that it can react swiftly in times of crisis. Bernanke has argued that without his determined actions, the country might have fallen into a depression. It appears to be a matter of the ends justifying the means. In our analysis, however, the means employed are the wrong ones. A key reason why Bernanke’s policies have been rather ineffective is because his policies are fighting market forces. Consumers would like to downsize further; such “downsizing”, however, means bankruptcies and foreclosures. Policy makers would rather subsidize consumers with massive fiscal and monetary stimuli – it’s simply politically more palatable. Because market forces are fought, such stimuli are rather ineffective, causing money to flow not to consumers, but where there is the greatest monetary sensitivity: precious metals, commodities and currencies of countries producing commodities may be the prime beneficiaries. And while Congress has stepped up spending on a grand scale in an effort to “stimulate” the economy, it’s little compared to the trillions the Fed can print, creating money out of thin air. It doesn’t have to be that way: traditionally, central banks do not play cheerleader, but party pooper. By keeping the leash tight on politicians, real reform has to be enacted: look at how the European Central Bank mostly allows the bond market to impose reform on policy makers in the Eurozone; it’s an ugly process, but a higher cost of borrowing imposed by the bond market may be the only language politicians understand. In contrast, in the U.S., we appear to have decided that the Fed’s magic wand will cure all our problems, allowing Congress to go on with business as usual, with the Fed seemingly financing everything, including government debt. The policies pursued by the Fed foster ever more leverage at the consumer level. Bernanke has pounded the table that he wants higher inflation. We have no doubt he will succeed, even as the markets are reluctant to embrace his determination – not so different, by the way, as the markets were reluctant in taking former Fed Chair Paul Volcker seriously when he announced in the early 80’s he would fight inflation. Indeed, we don’t think the Fed will rest until home prices are firmly moving higher – after all, that appears the only politically acceptable way to bail out millions (and a still growing number) of homeowners under water in their mortgage. But what happens if and when the Fed will want to mop up all this liquidity? We are rather concerned that with all the leverage pumped back into the system, any tightening will have an amplified effect, causing the economy to plunge right back down. That’s why Bernanke has argued that possibly the greatest mistake during the Great Depression was to raise rates too early; so much for raising rates within 15 minutes, as Bernanke has argued he could. In the early 80’s, consumers complained about high interest; however, if rates were raised today to only a fraction of the 20% Fed Funds rate of June 1981, the economy might implode. And while the Fed may be in charge of short-term rates, should the bond market get spooked because of the policies pursued, it may be impossible for the Fed to stem the tide. A weaker U.S. dollar may also ensue; we have yet to see a country that depreciated itself into prosperity. It simply makes no sense for an advanced economy like the U.S. to compete on price: the day the U.S. will export sneakers to Vietnam hopefully never comes. Just as Bernanke takes it upon himself to implement aggressive policies because Congress may not act according to his playbook, policy makers around the world are also slow to react. China, for example, has taken many steps to be ready to allow its currency to strengthen, from allowing its economy to move away from competing on price alone (i.e. a weak currency environment), to encouraging the production of value added goods and services where exporters may have more pricing power, necessary to allow exporters to remain competitive should the renminbi strengthen; to allowing more international trade to be conducted in China’s currency; to fostering the issuance of renminbi denominated bonds in Hong Kong, amongst others. Chinese policymakers are increasingly U.S. educated; they read the same news and share many concerns Westerners have. The key difference is that Chinese policymakers act in what they perceive to be China’s best interest and their decision-making processes are subject to a Chinese set of political dynamics. As a result, policy mills grind slowly. Similarly, policy makers in much of Asian and the Middle East act slowly. Not necessarily because of choice, but simply because that’s how local dynamics play out. Countries such as Bahrain or Saudi Arabia with their centralized control may be acting more swiftly, increasing food subsidies to pre-empt social unrest. Ultimately, for many countries in Asia, allowing their currencies to appreciate may be the most effective tool to tame inflationary pressures. In the meantime, countries in the Middle East may at some point come to the realization that changing the government may not lead to lower food prices. Unless the next president of Egypt is a great farmer, social instability may prevail for a long time. Incidentally, while we are not threatened with revolution in the U.S., discontent has been growing from the fact that real wages have not risen for a great number of people in over a decade. If you have assets, you may love Bernanke’s policies, as he pushes up everything from equity prices to [shh… don’t tell Ben] commodities. However, many that have to work for a living have seen their purchasing power erode. Bernanke puts the blame on a lack of education. However, his policies – in our assessment – contribute more to the wealth gap than policies of either Democrats or Republicans. In such an environment, disgruntled citizens may increasingly vote for populist politicians: in today’s world, if you can distill your political message into a tweet, you may have a better chance of being elected. This doesn’t just help explain the rise of the Tea Party on the right, but also contributes to discontent on the left, with many fearing President Obama’s policies are betraying them. What are the implications of all this? In our view, the polarization of politics will continue, making it ever more difficult to find common ground on tough political questions, such as entitlement reform. In the absence of compromise, the government may nominally pay entitlements as promised; it’s just that the purchasing power of what is paid may have eroded due to inflation and a weaker dollar. As these dynamics play out, investors may want to position themselves to take the risk of a decade of global political instability into account. Ensure you sign up for our newsletter to stay informed as these dynamics unfold. We manage the Merk Absolute Return Currency Fund, the Merk Asian Currency Fund, and the Merk Hard Currency Fund; transparent no-load currency mutual funds that do not typically employ leverage. 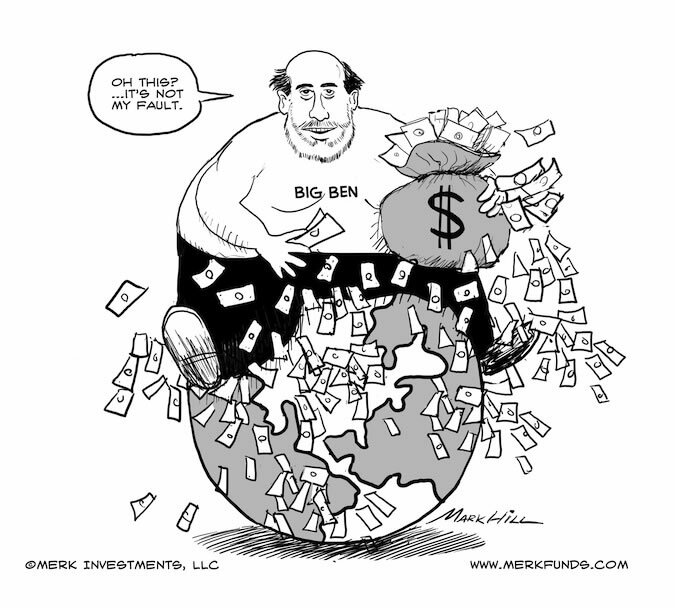 To learn more about the Funds, please visit www.merkfunds.com.